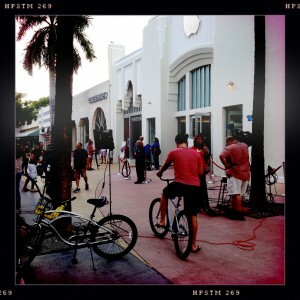 I was being a bit of a fan boy yesterday when I bought two new iPads in the Apple Store on Lincoln Road. We’ve even joined the live event via Twit when the announcement of the new gadget was made last week. So now I’ve got an iPad with razor sharp Retina Display, an improved camera, 4G LTE and a bunch of other stuff. Let me tell you all about my first day with The New iPad. I’ll pay close attention to the new camera features and compare them to the iPad 2 and the iPhone 4S. 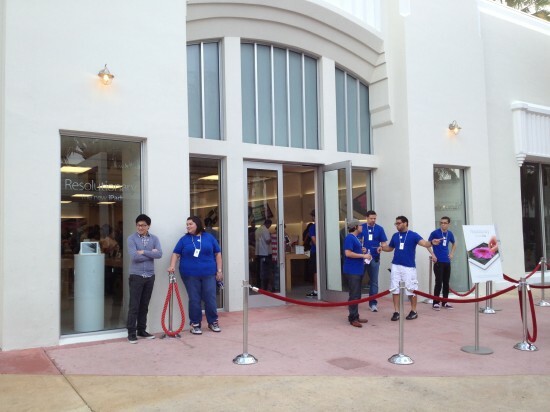 We expected to see vast amounts of people in front of the Apple Store this morning. And I guess Apple did too. We were there at 9am sharp to find various camera crews and an orderly queue formed of about 10 people. 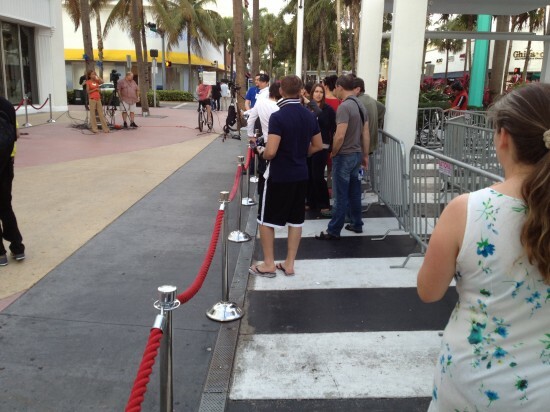 Barriers and security in place, all that was missing was the red carpet. The queue was much shorter than we had expected. 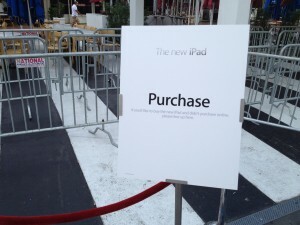 Did nobody want the new iPad after all? Our original plan was to have breakfast first and then go in, but since it was so empty we decided to park our Decobikes and walk in right away. A friendly Apple guy offered us a bottle of water, and we didn’t wait longer than perhaps 2 minutes. Then we were greeted by another Apple employee, Alex, who asked what he could do for us, we joked for a second and were probably caught on camera for XMZPWKJ-K7 News. Keep in mind that this was before the general store opening at 10am. The whole transaction only took maybe 5 minutes if that. I’m not disappointed, but I had perhaps expected campers outside, hundreds of people waiting for a device, you know – like we’ve seen from New York, Covent Garden and Regent Street. Maybe things are a bit more chilled out here in Miami Beach. Alex did admit though that most employees didn’t sleep much and that they had to re-organise the shop and prepare for the launch event. There was indeed a queue outside when they opened at 8am this morning. Interesting! 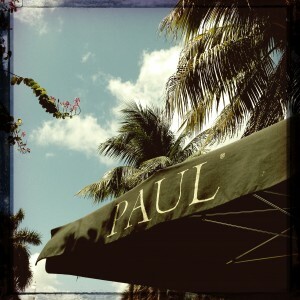 We had breakfast at Paul’s in Lincoln Road not far from the store, which seemed to be the iPad Hot Spot in the area. We counted about 4 people who all had bought their new gadgets and eagerly playing with them over a cup of French Roast. Julia and I joined with breakfast, but didn’t get out devices out. Good thing too because we left two minutes before a quick monsoon freak rain which lasted for about an hour! Those Apple bags are a great water protector. Back home we had some other stuff to take care of (mainly looking into more options to develop iOS apps with the new Redfoundry Fusion – which is free out of a sudden and for no reason) so I didn’t get a chance to have a play until after lunchtime. Let’s have a look at my first impressions next.